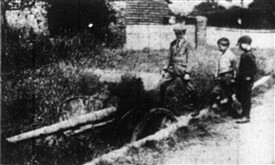 I spotted this picture, with the above caption, in the Southend Standard of 29th July 1920 which is a while after WWI ended and is a bit of a puzzle, ie what was it doing in Wakering and if it was captured why was it brought back and then dumped in a pond? I didn't see an article supporting the picture but will go back and take another look. Meanwhile has anyone anyone got any ideas? This page was added by Brian Pettitt on 17/04/2014. Here is a link to an article by M. F. Christophers about the German Gun. Comes from Richard Kirton's site under Miscellany / WW2 Nostalgia (RDCA-Admin).